The bones of what seem to be a prehistoric jackalope were uncovered near Douglas Wyoming in what could only be described as a heck of an accident. Apparently, during a "hold my beer" moment, Biff Landersmithe wrecked his ATV while trying to jump a dry creek. The vehicle ripped deep into the dirt turning up some rather odd looking bones. "The heck is that?" Biff was heard to say as he pulled his broken machine out. "Dang if I know," was the response from local experts upon seeing the bones. For the record, the "local expert" is Ralph, the oldest Douglas old guy at the local watering hole. Douglas locals say he has seen it all. There was an audible gasp in the room when Ralph uttered, "Tan't never seen nutten like that before." A local artist quickly drew a rendition of what the prehistoric jackalope might have looked like, based on the bones that were found. 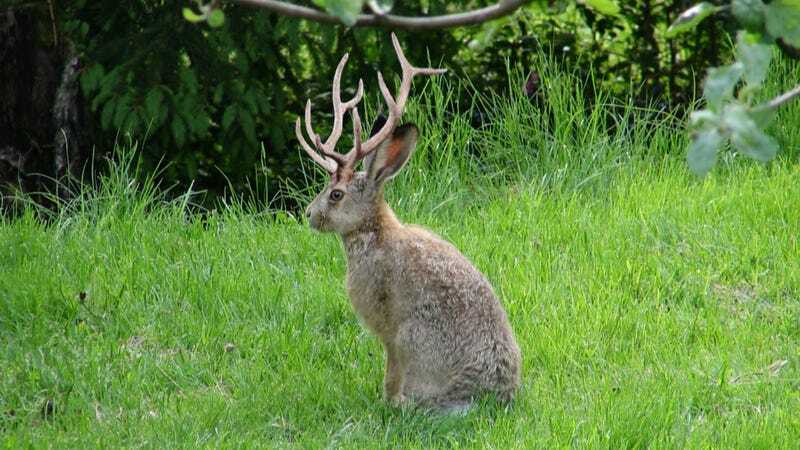 It is thought that about ten thousand or so years later the jackalope might have looked more like what we know today as we see in the second artist rendition. It is easy to see how the creature that was found could have evolved into what we see today. Beer has been purchased for a dig in the area where the bones were found. Wives have been informed that "the boys" might be away for a while. Until they find something, or until the beer runs out.